Did you hear that we are marching forward with the plan to find more "training inefficiencies" WRT enlisted training? Didn't we just outline this as a self-inflicted problem with our officer training in the surface force? Anyone here think their Sailors need to show up at their gaining command with LESS training than they do now? 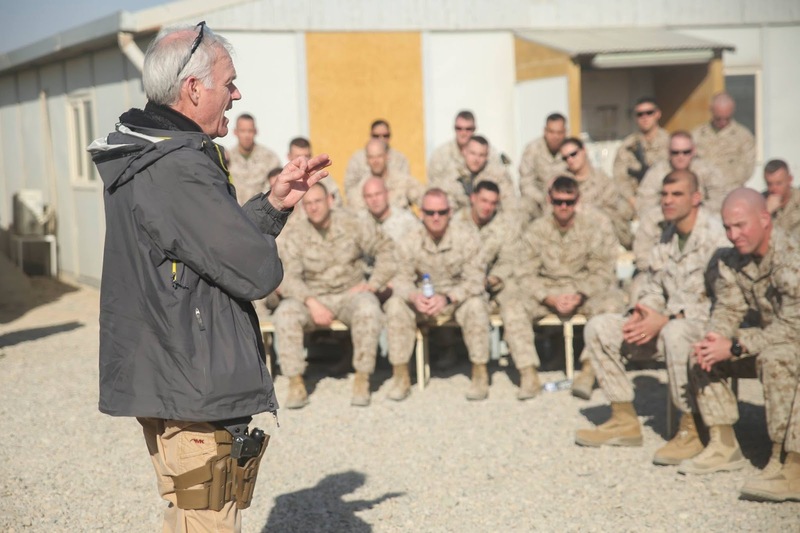 A few days before Christmas, SECNAV Spencer visited Marines and Sailors at TFSW in Afghanistan. 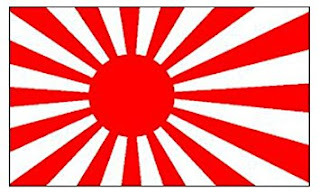 When you see it ... nuff said ... .
Of course, in a modest way Japan has been re-militarized for decades - regardless of what their post-WWII US written constitution may or may not say. Though not "Western" - Japan has its own gloriously unique culture - since WWII it can fairly be said that they are an adjunct to the West. They have a vibrant democracy with exceptional rule of law and universal suffrage. What they don't have is a fully realized and confident military. Considering what militarization did on the edges of living memory to Japan, the hesitancy is understandable. As we approach the end of the second decade of the 21st Century, it is well past time for Japan to join fully the defense of the modern world. She is a front-line state against a rising anti-democratic China, and her "big sister" the USA may or may not be able to help her as much as she would wish in a few scenarios. Japan’s government approved a record military budget on Friday but did not earmark enough extra money to stop a splurge on U.S.-made ballistic missile defense kit from putting a squeeze on funding for an ambitious domestic jet fighter project. That includes purchases of a new longer range interceptor, the SM-3 Block IIA, designed to strike ballistic missiles in space, upgrades for the Patriot missile batteries that are the last line of defense against incoming warheads and preparations for the construction of two ground-based Aegis radar stations. OK, let's do a little back of the bar-napkin math here. This is about a 2.5% increase over 2017. That brings their defense spending to $45.76 billion. If you include OCO, the USA spends ~ $639.1 billion. As a % of GDP, let's round things up to 1% of GDP, that is where Japan has been for awhile. We spend a bit north of 4% of GDP on defense, but ask our NATO allies to set a goal of 2%. Japan is as important to the USA as our NATO allies, so let's do a little what-if game. What if Japan spent ~2% of GDP on her military? That would be a budget of ~$91 billion. Let's assume no economies of scale and that her spending per service is about the same. As this is CDR Salamander, let's just look at her major naval units. Of course, she has other ships you can review yourself. Let's assume we could travel back in time to 2001 and Japan decided to slowly up her defense spending 1/10% a year. She would have been at 2% and holding six years ago. Being optimistic, let's assume that would have resulted in a doubling of the fleet. What kind of Japanese Navy would we have sailing with us in WESTPAC ... even with a modest 2% GDP spending? You want a maritime partner you can hold China in with ... or at least keep their attention locally? It is time to let the wounds of the wars of our fathers and grandfathers pass in to time. Japan is a good friend, and we should all encourage her steps to take her place as a linchpin to a modern, democratic, and free Western Pacific region. Take a look at these men and then their old, humble 4-stack DD-219, the USS EDSALL, the official Navy page does not do them justice, but for now - lets just look how she went out, in the end Commanded by Lieutenant (or LCDR depending on the source) J.J. Nix of Memphis TN, in one of the most untold stories of heroism in US Navy history. Nagumo’s Support Force consisted of the Third Battleship Division (battleship Hiei and Kirishima) and the Eighth Cruiser Division (heavy cruisers Tone and Chikuma). As fate would have it, destroyer Edsall had the misfortune to meet this formidable force on the afternoon of March 1, 1942. At a position about 250 miles south southeast of Christmas Island the cruiser Tone was the first to spot Edsall at a distance of 15 miles to the northwest. Twelve minutes later Chikuma sighted Edsall too, turned, and opened fire with her 8-inch guns at 1730. The range was extremely long at 21,000 meters (11 nautical miles) and all shots missed. Immediately, Edsall’s skipper, Lieutenant Joshua Nix of Memphis, Tennessee, laid down a smokescreen and began a series of evasive maneuvers that were to frustrate the Japanese for the next hour and a half. At 1747 battleships Hiei and Kirishima opened fire with their main batteries of 14-inch guns and ordered all units to attack the American destroyer. They began firing at a range of 27,000 meters (14-1/2 nautical miles) and their shots also missed the target. At 1756 Lieutenant Nix courageously turned his ship directly toward Chikuma and closed the range so as to fire his 4- inch guns, but his shots fell short. Chikuma stopped firing at 1800 when she entered a rain squall and Edsall laid down smoke. However, the intensive fire from all four Japanese ships resumed when the hapless American ship became visible again. Because they were shooting at such long ranges, Lieutenant Nix was able to observe the flash of the guns and turn his ship in time to avoid being hit. He did so approximately every minute. He also abruptly varied his speed from 30 knots to full stop and back again, while making turns as wide as 360- degrees. Since Edsall had suffered damage earlier off Java when one of her depth charges exploded too close astern, her performance had been reduced and there was no hope for her to outrun the enemy and try to escape. She could only stay on station and avoid destruction as long as possible. Japanese naval gunnery was relatively poor during the early stages of the war, often wasteful and ineffective. The attack on Edsall was a prime example. The official history of Japan’s navy states that some 1400 rounds were fired in the engagement but, until near the end of the battle, only one round found its mark. However, the action reports of Tone and Chikuma show that two direct hits (meichu) were made on Edsall, one by Hiei at 1824 and another by Tone at 1835. Still, this is an extremely bad percentage and much of it is to the credit of Lieutenant Nix’s superb ship handling under the worst possible circumstances. So frustrated were the Japanese commanders after an hour had passed that an order went out to the nearby Carrier Strike Force for the assistance of aircraft. Nine dive-bombers from Soryu and eight from Akagi attacked Edsall from 1827 to 1850, even while she made smoke for the fourth time. The planes scored a number of hits with eight 550-pound bombs and nine 1100-pound bombs, setting Edsall on fire in what he Japanese called a raging conflagration (kasai). Whether because the destroyer was now out of control or Lieutenant Nix made a final courageous gesture of defiance, Edsall now turned directly toward her pursers and came dead in the water. The battleships and cruisers pounded her relentlessly with their secondary batteries until she went down at 1900 in position 13-45S 106-45E, 430 miles south of Java. Cruiser Chikuma picked up an undetermined number of survivors, possibly as many as five. The Edsall survivors were taken to a POW camp on Celebes and nothing further was ever heard from them. After the war, the Army Graves Registration Service identified the remains of five sailors from the ship: F1 Sidney Amory, MM1 Horace Andrus, MM2 J.R. Cameron, MM3 Larry Vandiver, and F1 Donald Watters. Lieutenant Nix and his crew never received any official recognition for their heroic stand, which was in the finest tradition of the United States Navy. 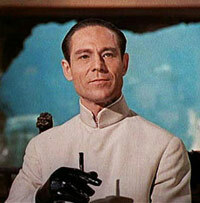 Captain Nix; you and your Sailors were Fullbore to the core. BZ. An encore FbF from 2008. A note: since this was posted, NHHC seems to have ditched all the old ship's pages. The links are dead and if you search the site, all you get are pics and general histories that may mention the ships. Sure, you can find all you want about transsexuals and LGBT in the Navy - but ship's history? To get that you have to dig and go through tons of directories - and know what danfs means. Here's the link. Unlike the old pages, there are no included pictures with text descriptions of each pic. Almost as if they are an afterthought. Just a bunch of dead white males anyway, I guess. So, you want to grow a Navy in a strong economy? NAVADMIN 288/17 is a war warning of sorts. Amazing what a few years can make, from throwing good people to curb to begging them to stay. Hell of a way to run a Navy. Thanks for everyone's patience since Monday's post - but this took some time. Go get a cup of coffee and let's get down to it. One downside of the review is that it wanders in to excuse making now and then, and gives the impression that things were done to the Navy, vice Navy leadership making decision to respond one way or another to challenges. Yes, the Navy as an institution - though bound by duty as it is - has agency. Now that I've softened everyone up, I want to make this point about the Navy’s Strategic Readiness Review (SRR) - your timing blows. Why release this the Friday before Christmas? Why release this one work-day before the President delivers his National Security Strategy? Timing matters and this document deserves the intellectual space and oxygen it need to have effect. Whoever signed off on the delivery time should be sent out to 10-DME in holding to think about what they have done. Anyway, as everyone else seems focused on the National Security Strategy, I want to put out my thoughts on the SRR for now. You can get the link here, or just read the embedded document at the bottom of the post, your call. Off the bat, the Executive Summary. This is almost perfect, and I feel the need to put out a disclaimer; I did not write this, not to my knowledge did any longstanding members of the Front Porch (though I know a few lurkers did, … I see you … ). In any event, we should no longer have to buy any beers from here on out. If that is too much, then we should have least received a footnote. Even in a non-peer-on-peer environment, the Navy and the nation can ill afford the readiness deficiencies revealed in the recent ship-handling incidents in the Pacific. These deficiencies are of profound consequence. While the shipboard causes that led to those tragic events have been identified, this Strategic Review finds there are institutional deficiencies that have developed over decades that must now be addressed. Yes Shipmates, as an institution, the Navy has gone Salamander. Yes, I'm being self-focused and a bit narcissistic, but I don't care. Its true. Vindication is a hell of a drug, and I won't deny it to the Front Porch. It came at a huge price, so I wish it never happened - but there it is. Remember over the last decade+ where I said how much I wish I/we were wrong, but I didn't think we were. Well, we're here. Many of these deficiencies have been observed and authoritatively documented for years, however the naval capacity that had been built up for the Cold War masked their impact. That past margin in ships, aircraft, and sailors enabled the Navy to make mitigating adjustments in fleet operations, training, maintenance, and funding to accomplish assigned missions. …and where was that nadir, and who was in charge? No, they don’t go full Salamander and call people out by name, which is fine and proper for such a document. That is our part of the ecosystem - but really isn’t all that interesting here. We all know who they are, and those who don’t can simply search the archive here going back to 2004 and it’s all there. This Strategic Review examines the long degradation of readiness and recognizes that improvements in readiness will not happen overnight – they will require sustained focus, commitment, and funding. This Strategic Review also recognizes that necessary improvements can only occur with the concerted leadership of the Secretary of the Navy, the Chief of Naval Operations and the support of the Secretary of Defense, Congress, and the American public. …and this “long degradation” came from where? When? How? This document actually goes there to an extent, and does a good job doing it. I’m not kidding, this is exactly what we asked for, and our Navy desperately needs. Those factors that drive readiness are all interrelated in a complex system-of-systems governed by regulations, policies, and processes that play out and act upon each other over time. This Strategic Review examined the systemic conditions of the last 30 years. … However, the cumulative effects of well-meaning decisions designed to achieve short-term operational effectiveness and efficiencies have often produced unintended negative consequences … Simultaneously, Navy leaders accumulated greater and greater risk in order to accomplish the missions at hand, which unintentionally altered the Navy’s culture and, at levels above the Navy, distorted perceptions of the readiness of the fleet. There is one understandable weakness here, and that is now and then the tone of excuse making creeps in. Part of the reason is that this document was created by many of the people responsible for the decisions of the last 30-yrs. They are putting themselves on report, and it is understandable that they would try to, if not apologize, at least try to explain why well meaning people trying to do the right thing would make the decisions they did - however wrongheaded they look in 2017. The above quote just soaks in “not until after my PCS cycle” decision making that got us here. 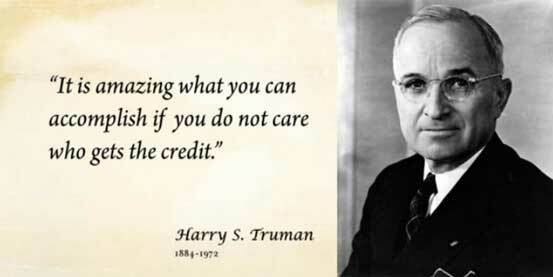 Time and time again, our leaders failed to stand up to what many knew was a long term error in thought and policy that would come back to bite us. Where was our General Shinseki? Here is the PCS cycle paradox in a nice, small package. The growing mismatch between the supply and demand of ships taxed fleet personnel and consumed material readiness at unsustainable rates. Within the fleet, often the only option to meet those demands were short-term tradeoffs to training, manning, and maintenance. Accepting those trades and increasing risk across the force was seen as necessary to get the job done. 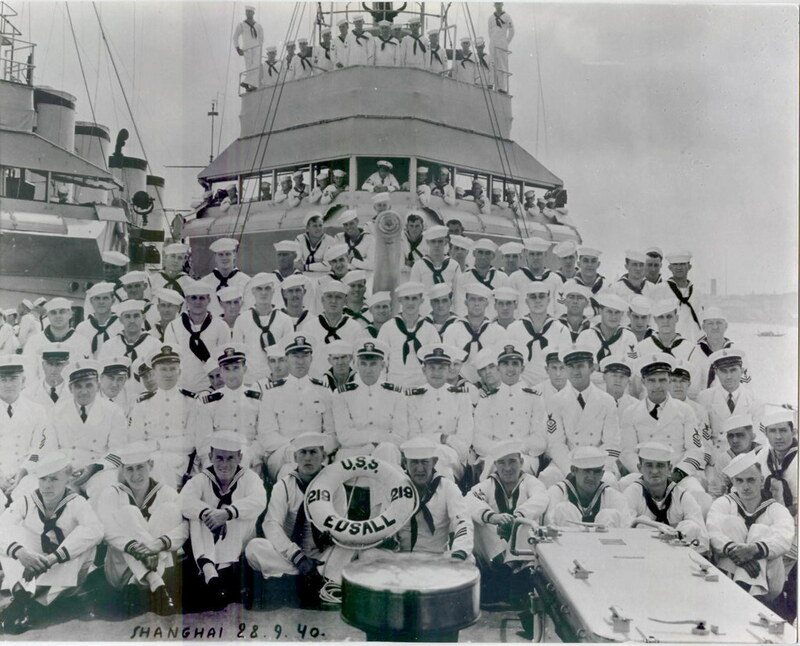 Over time, the Navy’s “must do” wartime culture was adopted for peacetime as long-term readiness and capability were sacrificed for immediate mission accomplishment. This is all on the leadership in place at the time. Their jobs as stewards of our naval power was to ensure that this did not happen. It did. With fewer resources available, ship crew workloads grew significantly, expanding their work days and weeks to unsustainable levels. Wait … calm yourself Salamander … and you too Front Porch. Remember, Big Navy is writing this. They are coming in to alignment. A decade and a half or so late, but they are here. We should welcome them here as the British and French welcomed America in 1917. Or maybe how we welcomed the French in 1942 or the Italians in 1943, I’m not sure quite yet. …the “normalization-of-deviation” began to take root in the culture of the fleet. The departure from a questioning culture prevented operators, leaders, and resource managers from stepping back and assessing accumulated risk and reinforced a mistaken confidence that operations remained within risk boundaries. Yes, they have gone here. Isn’t it glorious? This was exacerbated by the rapid increase in new overhead governance structures created in response to the Goldwater-Nichols Department of Defense Reorganization Act. Goldwater-Nichols was mentioned 34 times. Yes, it is that big of a problem. You recall our ongoing issues with Staff bloat? With the growth of headquarters, and staff centric promotion parameters, staff service began displacing service at sea as a significant driver of officer career paths, assignments, and promotions. Time to change the Board Precepts, don’t ‘cha think? When do the authors want action though? The time to chart a new course is now. Failure to address the compounding factors identified in this Strategic Review will have serious implications on the effectiveness of the Navy in the peer-on-peer operational era it is entering. How about accountability - properly focused? Accountability must always fall primarily on commanders, but accountability must also be sought and assessed in a systemic way, at institutional levels, in the policy decisions and processes that can set the conditions for aberrant behavior and negative outcomes. You can start to see here and other places the influence of the nuclear/submarine and aviation side of the Navy. Good on the surface force. I don’t think they had a choice, but it is welcomed throughout this document. If it soaks in, the surface force and our Navy will be better for it. At the end of the ES, there are four broad strategic recommendations. All are spot on and should be fully hoisted aboard. - Re-establish Readiness as a Priority: The creation of combat ready forces must take equal footing with meeting the immediate demands of Combatant Commanders. Sufficient time for training crews and maintaining ships is critical for restoring and monitoring readiness. - Match Supply and Demand: There must be a greater appreciation for the reality that only so many ships and sailors can be made available in a given operational cycle. The Navy must establish realistic limits regarding the number of ready ships and sailors and, short of combat, not acquiesce to emergent requirements with assets that are not fully ready. - Establish clear Command and Control Relationships: The Navy must realign and streamline its command and control structures to tightly align responsibility, authority, and accountability. - Become a True Learning Organization: Navy history is replete with reports and investigations that contain like findings regarding past collisions, groundings, and other operational incidents. The repeated recommendations and calls for change belie the belief that the Navy always learns from its mistakes. Navy leadership at all levels must foster a culture of learning and create the structures and processes that fully embrace this commitment. Before they dive in to the specifics, they define the scope. Again, this is exceptionally correct. …the Strategic Review examines the evolution of the Navy over the period since the service last faced a peer competitor – the Soviet Union. To that end, this Strategic Review specifically examines stress on the force, operational culture, budgetary tradeoffs, accountability structures, and risk management. Additionally, the Strategic Review analyzed career patterns, manning trends, training architectures, operational tempo, and the infusion of new technologies into the fleet. Finally, these elements are evaluated and accessed for their cumulative effect on the Navy’s operational readiness against shifts in U.S. strategy and evolving peer-on-peer threats. In case it hasn’t sunk in, we’re back to peer-to-peer. That has a lot of implications that I will write about in future posts - but not now. …the Goldwater-Nichols Act, the Defense Officer Personnel Management Act (DOPMA),3 and the manner in which they were implemented, changed the governance of the Navy’s career officer corps by adding joint duty requirements and establishing common career paths, promotion, separation, and retirement rules for all the services. That 1991 Base Force reduced the Navy to a target fleet size of 451 ships. The 1993 Bottom-Up Review confirmed the Navy’s new focus on presence, projection, and crisis response, while further reducing the target fleet size to 346 ships. the 1990s’ Navy operated more globally than during the prior decade. … the 1990s’ Navy conducted 85 named operations, up from 49 in the 1980s.5 These demands forced the Navy to lengthen deployments to provide forces in more geographic areas. The increased operational tempo stretched a fleet that shrank from 529 ships in 1991 to 318 in 2000, which in turn more rapidly consumed those ships’ service life. Increasingly, maintenance costs required the Navy to look for cost savings measures to offsets its funding shortfalls. Most significantly, the trades made to reduce manpower costs and the retention challenges imposed by the robust U.S. economy ultimately contributed to a shortage of manpower for at-sea billets by mid-1998. Additionally, the Navy’s operational tempo created significant challenges for the 24-month training, maintenance, and deployment cycle for ships and aircraft squadrons. Again … where was our Shinseki? Where was our VADM Connolly? Following 9/11 and Operation Enduring Freedom, the Navy found that precision strike was a critical enabler for future conflicts and shifted its focus accordingly. No. Wait. We knew that right after Desert Storm almost a decade earlier than 9/11. I know, I served in it and I was there at the debrief. This is one of the few errors I can find in the document. I’ll let it pass, but noted. Here is a heartbreak, but it is good that even in passing it is noted. A 2010 review of the surface fleet (Balisle Report) warned that increased operational tempo and lower manning were threatening the long-term readiness of the surface Navy. Ships were being run harder with less maintenance which required the Navy to retire them after just 25, or even 20, years rather than the expected 35-year life for which they had been procured. …and it was ignored. It was hoped that it would go away. We lost 17 lives indirectly because our uniformed and civilian leadership ignored the Balisle Report. Disagree if you want, but in your heart you know its true. The authors continue to drop dimes next to their bread crumbs. Where was Admiral No? While Russia is not as consequential a peer competitor as China, Russia’s invasion of Crimea in 2014, recent activity in the Baltic and Eastern Mediterranean, and resurgent submarine activity have also added to operational demands for the Navy. As all these global demands have increased, ships, personnel, and funding available for operations have not – all were being stretched. In 2014-2015, the Navy embarked on yet another effort to address the growing imbalance - the Optimized Fleet Response Plan. This plan was implemented to better respond to operational demand while endeavoring to provide greater predictability to the fleet. NB: you know that chaffs the hide of the Russians that we dismiss them as a secondary player at sea to the Chinese. I will allow and encourage it. I know there is a little bit of salesmanship directed at The Hill in this ending, but that doesn’t mean it isn’t correct. the Navy must recover its readiness and reestablish the standards that have historically ensured its preeminence. This is imperative for the Navy to adapt and prevail in peer-on-peer competition. This adaptation will require a fundamental understanding and appreciation of how much the Navy has changed over the last 30 years and how much those changes have impacted its ability to defeat peer threats and meet future challenges. The four recent accidents involving U.S. Navy warships are direct consequences of eroded readiness and are a leading indicator of unsustainable operations. Here, have a diagram. Yes, it is that a simplified diagram. In spite of knowing the “unsustainable” nature of our operations, this fall we patched together a three CVN photo op to WESTPAC. We know what had to be done to make that happen, yet in spite of all we knew already about the latent causes of the collisions in WESTPAC in 2017, we did it anyway. Miles to go before we sleep, Shipmates. Miles to go. Let’s just go Chapter by Chapter at this point, shall we? Not a full fisking – as I do have a paying gig and this is no small report, but I’ll do my best to pull out what I think the Front Porch would find of greatest interest. Despite this deterioration of readiness, the Navy accepted the missions and, at times, deviated from established standards and absorbed increased risk. Over time, this deviation from accepted standards increased, became normalized, and subsequently institutionalized. The operative part of that quote is “became normalized, and subsequently institutionalized." I’m repeating that for emphasis. This was done by specific people responding to rewards and punishments foisted on them by other people. This is not something that happened to our Navy. This was an active decision. This entire document does a fine job outlining what happened, and most of why – but it side-steps around much of the human dimension of why the “institution” of our Navy did what it did. This danger was known and yet accepted. Centuries of experience building, maintaining, and operating a navy would tell any informed leader that time would exact a cost, and yet the “institution” persisted. Changing this culture by restoring and sustaining readiness is vital. In turn, given the current congressional resourcing of the fleet, military and civilian leaders must accept less Navy presence worldwide. OK, then let’s do it. Do it now. We have known this for months, yet to repeat, just this fall we did a 3 CVN PHOTOEX in WESTPAC – draining and bleeding the Fleet to do so. If it is so serious, then why? Where is Admiral No when you need him? The global environment that affects U.S. interests has changed dramatically in the last three decades. Despite the peace dividend after the Cold War, technological advances accelerated global access to, and increased sea and air activity in, the global commons. Globalization of markets and ideas increased the competition for resources. Violent ideologies emerged, weapon and information technologies advanced and proliferated, and partner and adversary nations realigned. First, “violent ideologies” – we still can’t name it, can we – but strip that out; all the rest of the paragraph is simply ahistorical. These environmental factors to one degree or another have been present is almost every 30-yr period since Ragnar Lodbrok first left Uppsala. There is nothing that has “changed dramatically” – this is well within the normal course of human events. Yes, this overreach is a hobby horse of mine and I will bring it up every chance I get. Nothing we are experiencing is new. OK, off the hobbyhorse and back to this otherwise superb document. As opposed to a big quote, I’ll put out what may be the most important graph related to the Navy in the last decade. We see again more evidence of the “not in my PCS cycle” problem. Even with the advantage of forward deployed naval forces, the operational tempo in the current environment that insufficiently resources training and maintenance is unsustainable. This has created an “operations-first” mentality that was reinforced by the overall “must do” culture of the Navy. This, in turn, obscured current fleet readiness and incurred long-term risk in order to accomplish near-term missions. While an advantage in combat, this “must-do” attitude can have far-reaching and deleterious effects on overall long-term readiness. The Navy must restore readiness standards and the culture that enforces them, while informing civilian and military leadership of the consequential impact of less continuous Navy presence around the world. This behavior exists because it is rewarded. What happens to people who demand standards or rock the boat a bit? They get their FITREPs spiked, or a spiteful person calls the IG in and they get fired for something the IG stumbles on unrelated to the complaint - and they get spiked that way. We have to change the career calculus. Rational men and women respond to systems that have clear rewards and punishments. The culture we are putting on report exists and will continue to exist until those signals changes. When unchecked, the excessive use of waivers and an unbridled “must do” attitude compromise established Navy readiness standards, and cause senior commanders to inadequately appreciate the risks they are accepting. This defined a new normal, especially in the 7th Fleet. Yes, and who failed to do the checking? Why was there no one to do the checking? The cause was there was no desire to check. Senior leaders found that it was in their best interest to not check, and to reward those who did not check. No one said a word? ...the number of expired certifications in Japan skyrocketed from 6% in 2015 to nearly 40% in 2017. Additionally, in 2016, a ballistic missile defense ship in Japan was underway for 235 of 366 days, and has been underway for 231 days of 2017. Finally, and contrary to established standards, Forward Deployed Naval Forces in Japan are manned at levels well below the established fleet average. This is 100% the fault of senior leadership; not just the senior leadership that was sacrificed recently … but all those who had those positions dating back years. It goes up from 7th Fleet too. What were the priorities from those on high? Who was giving them the demand signal? 7th Fleet leadership did not create those pressures out of whole cloth. In an environment where this “normalization-of-deviation” has taken hold, ships and their crews perceive the certification process as merely a burden to their success, rather than the key to achieving individual, ship, and fleet readiness. This culture ultimately bleeds over into every facet of ship training, operations, and maintenance. Read that again, it is one of the most best descriptions of why standards are important beyond the immediate readiness event. Go ahead, read it again, especially the last sentence - I'll wait for you here. This report, to its great credit, goes in to a lengthy discussion about having a questioning culture – but that is not something we have to wait for. We know who the PITAs are in their respective communities. We know who the nudges are. We know who the iconoclastic, non-careerist, curmudgeons are; those who are in the fight, throwing elbows in the marketplace of ideas. Those who have all the right enemies for all the right reasons. Some of them are up for Flag Officer on the next board. 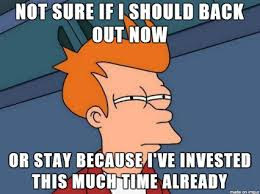 Some recently retired and could be brought back. We know who they are. Heck, send me an email if you wear 4-stars, I’ll give you one name for free that needs to come out of that board wearing a star. We can start changing the culture now. We can start sending a signal that if you want to be a Flag Officer you need a different pedigree than before. We don’t have to wait decades. We have the power to do it now. All it takes is institutional courage – and putting your actions where your mouth is. Set a “Readiness Standard” for operating forces that is achievable and strictly enforce it. Be careful who and what defines “achievable.” Defining deviancy down is not just a socio-cultural concept. Establish the Global Force Management availability as the maximum supportable peacetime force and limit additional demands for forces to the redeployment of existing Navy assets among theaters rather than using non-deployed, unready forces. If done correctly, this can be that tool. If we can really only do so many things in “peace” then define that and stick to it. In war, as FDR showed in the months leading to TORCH, the military may slow roll you about when they are ready (boy, what a different time we are in), but that was war. From a fleet perspective – regardless of what people may hyperventilate about – we are not at war. We are at a busy imperial policing tempo. There is a difference – and a lot more choice of action or inaction in the later than the former. Much of this chapter can be summarized as – again a regular topic for the Front Porch – staff bloat. In 1986, the Navy supported the five then extant Geographic Combatant Commanders with three regional Navy Component Commanders, under which four numbered fleet commanders operated a fleet of 556 ships. In Fiscal Year 2018, the Navy is comprised of 279 ships,24 about 55% of the 1987 Navy. Despite a reduction in operating units, there are now ten combatant commanders (six geographic and four functional commands) and six Navy Component Commanders under which five numbered fleet commands operate naval forces. Over the last 30 years the Office of the Chief of Naval Operations has expanded its staff positions and their seniority. The staff in 1986 was organized around the platforms the Navy operates: ships, aircraft, submarines, with each senior platform sponsor being a Vice Admiral who reported directly to the Chief of Naval Operations for management of the current and future readiness of the platforms for which he was responsible. In the early 1990s, the Chief of Naval Operations’ staff was expanded and reorganized along functional lines that paralleled the organizational structures of the Army, Air Force, and Joint Staffs. As a result, the principal advisors to the Chief of Naval Operations, the Deputy Chiefs of Naval Operations, were assigned exclusively to functional responsibilities (Manpower, Policy and Plans, Resource Integration, Logistics, etc.) rather than platforms. This structure provided greater clarity and commonality between the Navy and Joint/Unified Commanders facilitating increased interoperability and delineation of authorities. However, it also reduced the visibility, at the most senior Navy staff, into the readiness conditions of the platforms the Navy operates. To manage the expansion of headquarters and staff organizations, many senior Flag Officers have been tasked with multi-hatted authorities, including multi-service, multi-national, and service-specific roles to meet both operational and administrative control responsibilities and manage both current and future readiness. As pointed out in the Comprehensive Review, these many “hats” compete for the commanders’ time and divert attention away from ensuring a ready and sustainable force is available to meet the needs of Combatant Commanders. … This high-level focus on the current demand obscures long-term fleet sustainability. Money quote, and explains why those who have multiple combat or combat support tours do not select, but those who stay in CONUS “must fill” busy-work staff jobs do. The growth of the entire staff enterprise has caused a shift from a command-centric to a staff-centric culture in the Navy and, more broadly, the military officer corps. This is exacerbated by the joint duty imperative that draws many experienced officers away from Navy critical operational, maintenance, and training assignments necessary to enhance mastery of the naval profession and readiness of the fleet. We can change that focus for every board that meets from here on out. Just change the precepts. You want to change a culture? Change what motivates it. Will good people get lost in the shuffle? Sure they will, but they do anyway. The breaking point in the crunch is so thin and insignificant, it really is a wash anyway. Someone will win, someone will lose. Pick your rate, pick your fate - we all know the drill. Speaking of culture, give a nod to this – admitting that the submarine/nuke and aviation community culture is doing a better job and is worth the surface force making the effort to emulate the best parts of both. With the surface fleet as small as it is today, replicating the process the Navy Nuclear Propulsion Program employs for direct and regular communication from Commanding Officers of nuclear ships to the Director, Naval Reactors, is worth considering. In the Naval Reactors model, Commanding Officers communicate via letter with the Director on a quarterly basis (monthly while in an extended maintenance period), discussing manning issues, training requirements/ assessments, overall readiness status, and any major deficiencies in equipment or performance. This model has proven valuable in providing the Director with clarity concerning the readiness and training status of nuclear powered ships. An analogous model could be employed in the surface force to transparently communicate manning, training, and readiness conditions to the respective type commander beyond what is currently provided in the Defense Readiness Reporting System, Navy (DRRSN). The rest of the chapter is devoted to the Type Commander Organizational Structures. My weakness here, I really cannot discuss it without having a 6’x4’ white-board and six different colored pens. I’ll just say that I concur with all recommendations. …fewer, more complex ships spending a greater portion of their time at sea with smaller crews. You think? Just classic. “Optimal Manning” and all that crap does not look so “Optimal” now, does it? Infuriating that it took until 2017 for Big Navy to admit how wrong it was, but I’ll take it. In response to decreasing budgets, the Navy made a series of decisions that increased operating tempo, reduced manning levels, and changed career progression patterns resulting in significantly diminished opportunities for Navy officers and enlisted sailors to master operational and maintenance skills. …and to make it worse, it begat LCS and DDG-1000 with this foolish concept baked it. To a lesser extent to LPD-17 and the FORD CVN are feeling the pain, but they are more fixable. We have now reached the point that no one can argue that the critics of “Optimal Manning” were not right from the beginning. That along with “Just in Time Manning” and modified/diluted readiness requirements are finally all just discredited frauds. There is a lot of ruin in a Navy just as there is a nation. We can claw our way back, and we will if we build off this review. Smaller crew sizes increase the need for officers who are incentivized to invest in careers at sea. …and yet our acts of commission and omission were in the opposite manner. In a deep-dive in to latent causes, a lot of time is spent dragging Goldwater-Nichols in to the light to be gibbeted for all to see. The intent of these Goldwater Nichols provisions was to ensure that Flag Officers had joint experience and that lower ranking officers with joint experience remained competitive for promotions. However, the implementation of the Act resulted in each of the services making an unnecessarily large number of their officers joint qualified. …and yet they were ignored. The effect is more officers being diverted from assignments of fleet mastery to joint training and joint duty assignments necessary for flag careers. Not everyone wants to have command. Not everyone wants to be a Flag Officer. I know you went through three wives, all your friendships, and half your liver to get there, but not everyone else wants to - and that should be OK.
A relaxation of Goldwater-Nichols Act provisions, combined with a reduction in joint headquarters’ billets, would enable the Navy and the other services to be more selective in grooming officers for leadership of both service and joint forces. Relaxation? How about elimination? You can start with something the Front Porch is familiar with; PLAN SALAMANDER for Officer Progression. No War College or Joint Requirements until after CDR Command. I have to non-concur with the desire to be “more selective in grooming” too. Done too early, and that will eliminate too many good officers, is ripe for abuse and favoritism, and will result in perfumed princes that are disconnected from the fleet. Through CDR Command only one thing should matter; performance in your warfare area. That will be the best culling function you can have on who should progress up the Chain of Command. All else is vanity. Was the surface force looking for a competitive advantage over the other communities? Sure seems like it, and is well in line with the decision to make the ~+/-100 Sailor LCS a CDR Command, vice LCDR Command. All about promotion boards – not about building proficient surface warfare leaders. All about cultural priorities. The next note on education I can argue both sides of. I responded to this demand signal as a senior LT. I have a Master’s Degree from a State university in a residency program while holding down a full-time shore duty job. Pretty much worked two full time jobs to do it. I got the check in the block – all the Navy wanted – and got the sub-specialty code for it, yet the Navy never once used it. All they wanted was the pain points for their metrics. An increased focus on graduate education further decreases opportunity for officers to gain proficiency working with the fleet. Often, however, these graduate degrees do not directly contribute to a deepening naval or tactical mastery and for many officers a master’s degree requires an additional tour away from operational assignments. In 2015, 85% of the commanding officers in the unrestricted line communities had at least one master’s degree. Of those who had master’s degrees, approximately half received their degrees while attending an in-residence program during a shore tour. Here’s an unpopular request. I want to see the numbers when you take out Master’s Degrees earned while that shore duty was at War College - related to that War College tour. IMAO that simply does not count. No offense, but it doesn’t. In 1996, the Surface Warfare Community discontinued the Senior Officer Material Readiness Course, which provided prospective Commanding Officers with the skills needed to understand and effectively manage their material and equipment. The loss of the Readiness Squadron billets combined with the loss of the Senior Officer Material Readiness Course led to fewer officers with a thorough understanding of how to maintain increasingly complex warships. The surface fleet aggravated experience loss by eliminating the sixteen-week Surface Warfare Officer School basic course in 2003. If you were looking for a mark to put on your calendar, you can call this period the “Era of De-professionalization of the Surface Force.” What a lamentable period of time. A great shame to us all. A second issue contributing to declining surface warfare officer naval operational expertise is the long-term Navy practice of over accessing junior officers. For more than 20 years the number of junior officers commissioned into the surface warfare community has exceeded the number of ensigns required in afloat billets.39 This helps ensure an adequate number of surface warfare officers are available later for department head tours at sea. The Comprehensive Review recommended aligning “the number of SWO [surface warfare officer] candidates assigned to ships with the billet requirements.” While the Strategic Review concurs with the intent of that recommendation, it would have to be implemented in a way that ensures it would result in a sufficient number of officers progressing to department head. I stand by the argument that you would retain more people if they were not in a shark tank like that. Just horrible. Train them well. Let them do their job well. Make them know their job is valued and they will stay. You will need to assess fewer. Q.E.D. I take zero pleasure the next “I told you so,” as this was the exact point that those who lost the argument made a couple of decades ago. A hollow victory I wish we never would have to claim. Over time, officers with less experience were promoted into leadership positions where they were training the Navy’s newest junior officers. The result was a decline in surface warfare officer skills. The pendulum has swung too far and a lower level of training and experience was normalized. A rebalancing is needed to ensure the Navy has an officer cadre comprised of officers with deep naval expertise and a more appropriate number of joint-qualified officers with the breadth of experience needed to succeed in joint operations. Yes, I will continue to beat this dead horse. Big Navy has joined in the beating, and I will not deny myself another run at it. The Age of Transformationalism rears its ugly head again and again in this report. All the below was force-moded by senior leadership. Don’t bother with excuses. This was a deliberate decision with intent. These cumulative reductions in sailors available for fleet duty were accommodated by the adoption of the 2002 Optimum Manning initiative, which reduced destroyer and cruiser manning by 18% and 12% respectively. In its May 2017 Navy Readiness assessment, the Government Accountability Office found that reductions to crew sizes made in the early 2000s were not analytically supported and in congressional testimony stated the reductions “may now be creating safety risks.” The Government Accountability Office went on to say, “With fewer sailors operating and maintaining surface ships, the material condition of the ships declines, and we found that this decline ultimately contributed to an increase in operating and support costs that outweighed any savings on personnel.” The Strategic Review agrees. This was all known, but welcome to the party nonetheless. The combined effects of Optimum Manning and the Navy’s implementation of the 2001 Revolution in Training significantly degraded enlisted expertise. Revolution in Training was intended to overhaul the Navy’s schoolhouse-centric individual training system by transitioning to a lifelong-learning continuum reliant on computer-based and on-the-job training. All the “Old Think” shaming done by the “smartest men in the room” of this period will remain a black mark on our Navy. The lost lives and destroyed careers cannot be recovered, but we can affect the future. This is what this report is trying to do – but it needs follow-through. I would like to see this broken down by cost source to ID main drivers, and to the degree we can do a little regression analysis as well. As I know part of the answer, I’m not sure Big Navy is ready to go there – but it would be a nice exercise to go through. History shows the potential for technology-enabled manpower savings were routinely overestimated. Three of the last four ship classes required increases to crew size after fleet delivery. I’m sorry, I can’t stop laughing. What has it been denizens of the Front Porch? Well over a decade we’ve been beating that drum? Both versions of the Littoral Combat Ship required significant increases in personnel beyond original estimates, and the Zumwalt-class guided missile destroyer already experienced a crew size increase of 11% with the full extent of needed manpower increases unknown until its systems are fully tested and operational. This is where we deserve at least one footnote, but that’s OK. The rest of this chapter is mostly a validation of the critics of the Transformatinalists and their ilk. Due to the complex mix of pressures and constraints on the personnel system over the last few decades there is no single area of personnel development, manning, or training where isolated action is likely to create lasting improvements or compensate for previous shortfalls. …overly optimistic assumptions about the ability to reduce crew sizes and lack of institutional commitment to long-term training reform, appear likely to be repeated if systemic change is not undertaken. That’s strong, and welcome. Breaking it down to parade rest, indeed. The recommendations are so good I just want to get nakid and roll around in them. As this is a family blog, instead I will just quote them in full. All are enthusiastically endorsed. All should be implemented as soon as possible. Not practical; possible. 1. Restructure officer career paths, particularly for surface warfare officers, to refocus on mastering skills crucial to the Navy. a. Seek legislation to relax Goldwater-Nichols Act promotion requirements by lowering the required percentage of joint qualified officers. In the absence of relaxed legislation, take maximum advantage of the waiver provisions in the Goldwater-Nichols Act. Simultaneously, work with the Office of the Secretary of Defense and the Joint Staff to reduce the number of staff tour billets, particularly officer billets, outside the Department of the Navy. b. Amend Defense Officer Personnel Management Act related statutes and policies to allow the Secretary of the Navy to retain a modest number of qualified Lieutenants and Lieutenant Commanders to serve extended careers without convening boards for their selection and annual retention. c. Amend Defense Officer Personnel Management Act related statutes and policies to remove Limited Duty Officers from control grade table strengths (O4 to O6) and allow the Navy to build more deep naval expertise. d. Discontinue the fleet-up model for surface ships and place a shore tour between Executive Officer and Commanding Officer tours, except in exceptional cases mandated by unusual career paths or needs of the Navy. The Strategic Review recognizes that there are likely costs associated with such a change, including the potential for lower retention, greater permanent change of station costs, and the need for longer or additional screening boards each year. e. Restrict the practice of surface warfare officers serving their second division officer tours on embarked staffs to those who were preselected to convert to a restricted line community. f. Review the number/length of department head tours and the number of department heads required per ship. 2. Establish a process to measure the true workload of ships’ crews, both periodically and after upgrades and modernizations, to determine if manpower models adequately predict personnel requirements at sea and in port. This should include identification and quantification of added demands and additional work that affect readiness and technical qualifications. a. Adjust ship manning levels to allow for adequate crew rest, performance of extraneous and collateral duties, training (routine, on-the-job, and new hardware/software) that occurs while aboard ship, and should include some excess capacity. 3. Require officers to maintain a career record of watch-standing hours and specific operational evolutions for surface ship watch standers, similar to naval aviator flight hour logs and separate from current deck logs. 4. Establish minimum hour and evolution requirements to become/remain a qualified Officer of the Deck, Combat Information Center Watch Officer and Tactical Action Officer. 5. Require successful completion of relevant simulator training scenarios to maintain watch-standing qualifications. This chapter is aimed at the DC Wonkosphere. Important, but you need to just read it yourself. I’m bored just writing this sentence about it. The recommendations are solid. ....there is a correlation between resourcing levels and the priority the Navy places on various operating, manpower, and recapitalization accounts that make up the Navy’s Budget. In other news, I tend to be opinionated. This is when I remind you that at present we are unchallended on the high seas, and yet? …we continue to shoot up the horse. While the standard for facilities sustainment should be in the range of 85% of the sustainment model funding levels, the Navy is only reaching the 70% level. Since ship maintenance availabilities (as described in section 4.1 above) are now intentionally shorter, the capacity of facilities and personnel are limited by the system’s ability to accept and adjust for these emergent issues. 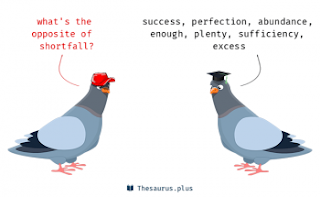 The emergent problems have not had planning and design work done to fix them; the parts have not been ordered; the job has not been efficiently sequenced into the scope of work nor has it been included in the overall production plan. Overcoming all of this ultimately makes the total bill higher than planned. This is all a conscious choice; a deliberate choice. No one forced us to do this. This was all priories. It isn’t that we don’t have the time or money for it – it just wasn’t a priority. Adopt a Training & Readiness matrix (similar to the aviation Training and Readiness matrix) to define what each ship must accomplish in each phase of training, the number of times it has to be demonstrated, how many times it can be simulated, and what the external grading criteria are for meeting the requirements for each level of certification. a. Develop effective measures of overall ship readiness that accurately describe what is necessary to achieve and maintain certification in each warfare area. Mostly a red-tape and bureaucracy complaint list and an opportunity to beat up on Goldwater-Nichols again. Tough to keep using that as a shield for too many things. It is the law of the land. Not policy or procedure, but law. If it needs to be changed, it needs to be done in Congress. The two areas that the Goldwater-Nichols Act profoundly impacted were officer career paths77 and chains of command and associated authority. With respect to lines of authority, although military advice often comes through the Chairman of the Joint Chiefs of Staff, the operational chain of command runs from the President to the Secretary of Defense to the regional Combatant Commanders. Service Chiefs, who best understand the capabilities and readiness of their forces and who are supported by the significant doctrine development and tactical expertise of their school houses, and the strategic insights from their staff and war colleges, are not part of that process. …in the area of readiness, under the Goldwater-Nichols Act, there are confusing lines of authority and separation of, and competition between, readiness and operational responsibilities. Again and again in this report, I keep coming up with the desire to know who has the power to say, “no.” People do, but they don’t. Unless the authority over these decisions can be restored, ships will continue to be operated when they are no longer fully certified in all their respective primary missions or have inadequately trained crews to meet the full range of operational assignments. The reason they don’t? Simple. The system of reward and punishment. While the Goldwater-Nichols Act has been effective in enhancing current joint force operations, after more than 30 years of existence it and its implementing details have not been substantially reviewed for its overall effectiveness for a return to peer-on-peer competition. Hey Shipmate, have you complained about the admin overhead your UIC suffers under? 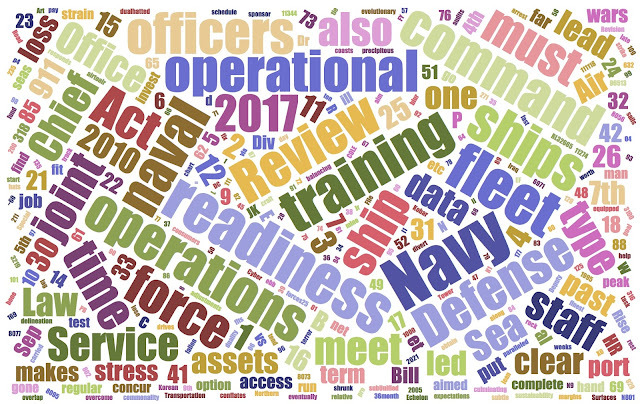 With respect to congressional oversight and direction, the Navy is a compliance-based organization and dedicates whatever resources, including staffing, necessary to respond to oversight and direction. Such compliance is resource intensive and frequently distracts leadership’s attention from its primary responsibilities. Responding to ever-increasing National Defense Authorization Act direction, environmental, safety, and acquisition requirements, as well as other legal obligations, requires significantly increasing involvement by the Secretary and the Chief of Naval Operations. One would hope that the Secretary and CNO, seeing the challenge they face with admin overhead, will take that onboard and act on the admin overhead they have put on our Navy in turn. Take action on this and you’ll get even more focus on the things you want people to act on in the recommendations in this report. We all only have a 24-hr day. Seek relief, in coordination with the Office of the Secretary of Defense, from excessively detailed external oversight and reporting requirements. I’ll take this as more apology than excuse. Accepted. Well-intentioned, dedicated Navy leaders, faced with complex, near-term problems, have made difficult decisions over many years using the best available information. 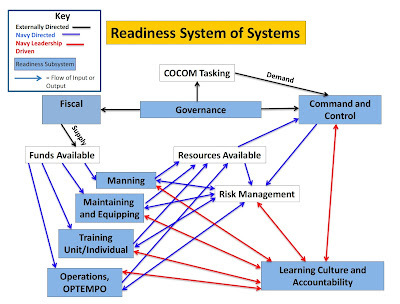 To better understand the dynamics of how large complex organizations, like the Navy, learned and adapted following a tragic event or series of safety mishaps, this Strategic Review included discussions with key leaders of leading global companies in the aerospace, maritime, and medical industries.91 They were selected because they are recognized global leaders in their respective fields and because of their records of learning and changing after tragic events. Each company official articulated that, in retrospect, their tolerance for, and accumulation of, multiple, seemingly minor, decisions made to “get the job done”92 degraded recognition of unsafe daily operations. This goes on for another page and a half. What do I not see? I don’t see recognition that other smaller, but very similar, navies do not have the same fundamental failure of seamanship that we have. Have we talked to not just “industry,” but to the Royal Navy? How about the Royal Netherlands Navy? Heck, how about the French even? If we are too proud to reach out, that is very petty of us. We ask a lot from our allies, we should acknowledge that there are some things we can learn from them in the balance – and we should be out and proud about it. The Navy has a culture that currently prioritizes immediate mission accomplishment over long-term sustainable readiness. While the Navy espouses a learning culture — and there are pockets of excellence — a myriad of previous readiness reviews, when viewed holistically, indicate there is much work to be done. There have been similar, repeated, conclusions and recommendations made over the years for improving Navy's overall readiness.94 A more structured, data-driven system for ensuring attention to, and learning from, the lessons of the past can only increase institutional attention to the core fundamentals of safety, seamanship, and training. The Comprehensive Review echoes previous report findings and correctly identifies the Navy, in the aggregate, has not truly embraced a culture of learning. Such a culture depends upon data and critical analyses to facilitate rapid, informed decisions. On the following point, I think this review does a solid job in setting the table. At the present we aren't there, but we can get there with the proper signals and actions from leadership. Successfully achieving a culture of learning requires implementation of a comprehensive system with clear lines of authority, accountability, and responsibility. Like the company leaders the Strategic Review Team spoke with, Navy leadership must now take ownership of the issues and lead the corrective action not only in the specific shortfalls identified in the various investigations, but by addressing the decisions, programs, policies, and systemic gaps that would have avoided and/or arrested them. 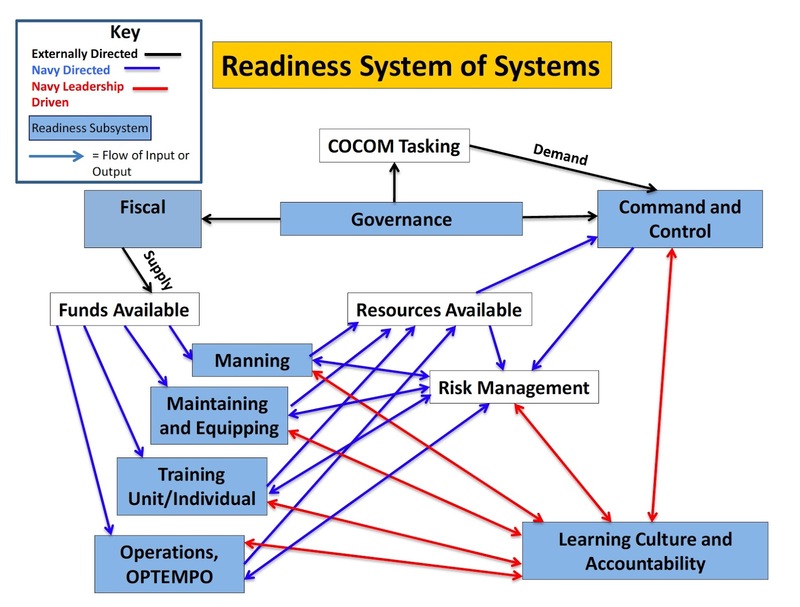 As indicated in the Comprehensive Review, flaws have been identified in the underlying systems, organization, processes, regulations, and culture that diminish Navy readiness. If you are wondering what “industry” are we benchmarking, it is in Appendix A. Appendix B lists the individuals consulted. I have nothing but good things to say about these people. I might have ventured a bit outside the traditional lines here, but that would just be changing happy to glad. Good balance. I’m not going to quote any of this section's Recommendations here as it will harsh my positive vibe about the report. I mean, really people; aren’t we already supposed to be doing these things? OK, you think I’m being a fussbucket? Fine, this is what I’m talking about. The Secretary of the Navy and Chief of Naval Operations, with the support of the Master Chief Petty Officer of the Navy, must personally lead the Navy … built upon systemic data analyses focused on leading indicators … Employ system dynamics modeling and simulation … better identify leading indicators for use in predictive analysis. I’m pretty sure this is in place, if not – then things are a lot worse than I thought. Everything behind the curtain must have really gone TANGO-UNIFORM since I hung up the uniform in ’09. Then we come to “Righting the Ship.” A nice summary you can read yourself. I can’t add to it, and anyway my snark bucket is down to its strategic reserve – not that it needs any snark. I like it. I am always humbled and honored by this bunch taking the time to visit and contribute, many of which have been commenting, emailing, or lurking since we started here in 2004. The Front Porch is well aware that almost from the start of his tenure, I was highly critical of former CNO Admiral Gary Roughead, USN (Ret.). All my critiques stand, but if here and there I threw an unnecessary elbow or had an edge where perhaps it shouldn’t have been, I will drop an apology to him – so … if needed Admiral Roughead, my apologies for any unnecessary rough-and-tumble over the years. You’re a SWO, so it goes without saying that you should have been able to handle it, and I am sure you have been called worse by better. Why am I doing that here? Simple, Roughead was a Co-lead on the team that produced this report. This report is highly critical of the years he was senior leadership. That is something. It takes a certain type of professional to be able to be in that position and to husband a review like this to publication. Perhaps someday we’ll know on a personal level why when a senior officer he took the point on some issues that he did, and supported programs the way he did, but now is not the time for that. As we say here often, good people can find themselves in difficult jobs and do the best they can. He needs no redemption and owes nothing to anyone, but at least for this little blogger, I am reassessing my holistic opinion of him. There is something even more personal that came out of my reading this report, something I let leak our early in the post; vindication. Not just vindication for the Front Porch and "CDR Salamander," but for the “Old School” naval blogosphere who during the ‘00s fought a losing battle, a holding action, as the problems this report outlines were set in as policy and began to manifest themselves in the Navy we all loved. I’m still here, as is EagleOne. I wish Lex were still with us for many reasons, but mostly because I wish we could have had one of our entertaining email exchanges offline for those things we couldn’t really put on a blog, but were comfortable sharing among each other. I also think of my fellow paleobloggers who fought the good fight, but went on to other hobbies. Chapomatic, Joel from TheStupidMustBePunished, and even SkippySan (NB: I know I’m leaving some important people off, no offense). There were many more who did not blog, but worked in the bureaucracy to move the needle and stop the train wreck they saw coming, but failed – often having their careers damaged by petty men in the process. There were those who didn’t even comment, but did email, call or even have hand written notes sent through intermediaries - helping provide context and information so Lex, Chap, Joel, Skippy and I could form better critiques. And of course, there was the Front Porch. Byron, MTH, LT B, and so many more who were there from the start and came in with their extensive experience to help others to know that they were not alone in seeing the madness around them. Even when there was disagreement in details, at least you knew we were always trying to stop things before it was too late. They were right. We were right, but I’m comfortable saying this – to a man I know we wish we were wrong. We would wish that as 2017 was ending that all the fruit promised by the Age of Transformationalism had come to pass. That the leaders and visionaries we had then really were so much better than the generations before them such that they could ignore the hard lessons of centuries - and we were blogging our apologies to them. Finally, because this is CDR Salamander, we do have to point out something now instead of saving it for a Thursday. You want to know how serious a document this is? Do a word search for “diversity.” Look for any mention of, “women” or “female” issues. You won’t find them. Why? Simple, they have zero to do with a well-functioning Navy. They are what they have always been, a distraction. A socio-political distraction. That distraction was part of our lack of focus on the problems that brought this report in to being. When a CNO says diversity is his #1 priority, something else moves off his scan or gets less time. If X% of his travel and staff time is distracted on socio-political issues, that is time, effort, and TDY funding that is not being used to ensure that the fleet is properly trained, manned, and equipped. When the SECNAV and SECDEF are out promoting “Lean-In Circles” and allocating BA/NMP simply to feed one side of the socio-political divide, what BA/NMP is not being funded? What meetings with fleet Sailors are not taking place? I’ve often said that the Navy is not being a serious institution when it allows itself to be a photo-op puppet of socio-political hobby-horses. It isn't. In this line of work, if you are not focused and serious, people die. We don’t discriminate on the basis of race, creed, color, or national origin. We enforce that policy. We don’t need an entire infrastructure bought and paid for based around a policy that is already being enforced. We don't need to fund other people's political programs - or their projected insecurities. The law says we have to do X. We do it, we enforce it. We don’t have to play cheerleader for one side or another. That isn’t out job. Our job is to support and defend the Constitution against all enemies, foreign or domestic. Our job is to ensure that we have the best trained, manned, and equipped Navy and Marine Corps we can given the resources provided. Anything that does not add to the above is not our job. It takes leaders to enforce that. It takes focus to see that through. It takes a culture to live that. Let’s reset and get to work. How Do You Feed Your Rage and Shame?